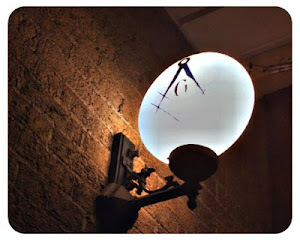 Years later, I would be Initiated, Passed and Raised in Freemasonry and became a life member of my Blue Lodge. 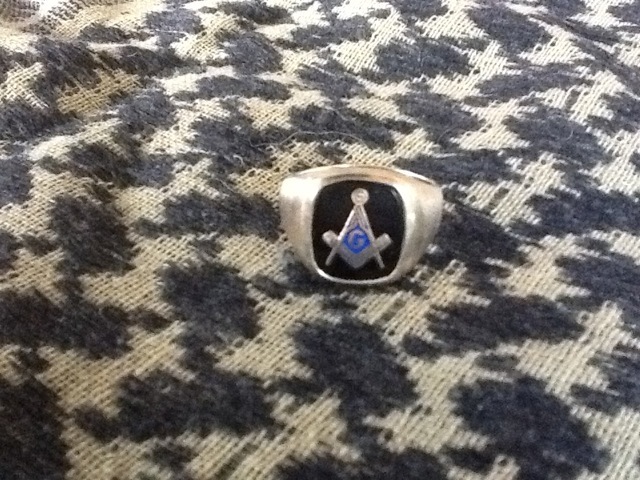 Shortly afterwards I remember being given my first Masonic Ring by my father. Not a particularly fancy get up. Just a simple gold ring with a black center piece and an inlay of the Square & Compasses with a blue background behind the G. I still have this ring and it too sits on a shelf in my office. The thing I liked the most about this ring was the fact that it didn’t particularly stand out as “flashy.” It was nice & simple. If you knew what you were looking at, you just knew. Fast forward a few decades and my father loads up my truck full of “stuff” prior to his departure for Florida prior to the pending inescapable Chicago winter. One of the items he loaded into my SUV was his briefcase that he used for his Lodge activities. I remember the one he had prior, but it had worn out long ago, although both had the same plastic vehicle emblem for the Shriners. He asked that I not bother with the contents until such a time as I “saw fit.” When I returned home, I unloaded the truck and placed the briefcase in the corner of my basement without a second thought. Fast forward again and my father passes away in Florida. After a whirlwind to and from trip to take care of him in his final hours, I was exhausted after being up for more than 2 days straight. As I arrived home, something drew me to the basement, the exact opposite direction of my bed! Whatever the reason, I found myself carrying my father briefcase up the the kitchen and placing it on the island. It took me some time to get up the nerve to release the latches holding the case closed, but once I did, it exploded open! I started combing thru the contents of this pseudo time capsule only to settle on a small wooden box. I had never seen this box before and I was almost afraid to open it. Given the context of the rest of the items on the inside, it was either masonic or evidence form a crime scene from his Police Department days in nature. I finally got up the nerve to slide the top of the wooden case open and was completely shocked by what I saw inside. There were a few “orbs” of different sizes that, when worn on a chain, can be rolled out to form a cross with Masonic symbols etched into the sides, a few Grand Lodge Challenge Coins and my Dad’s Masonic Ring. Suddenly the ring was more beautiful than I had ever remembered. The ring is made of 10K gold. On one side there is a Trowel and on the other is a Plumb. There is a “Column” of diamonds on either side. 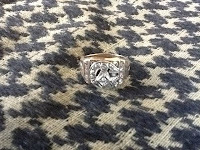 In the center is a silver “G” under a Square & Compasses which holds a solitary diamond in its center, all of which sits on the etched gold outline of a Maltese Cross. I may never know my father’s exact reasoning behind his chosen words when I would try to put his ring on my hand when I was just a little tyke, but I just hope I can wear his ring now with the same convictions, morals and principles as he did. I don’t think I will ever feel as though I deserve to, but I am willing to give it one heck of a try, that is for sure. 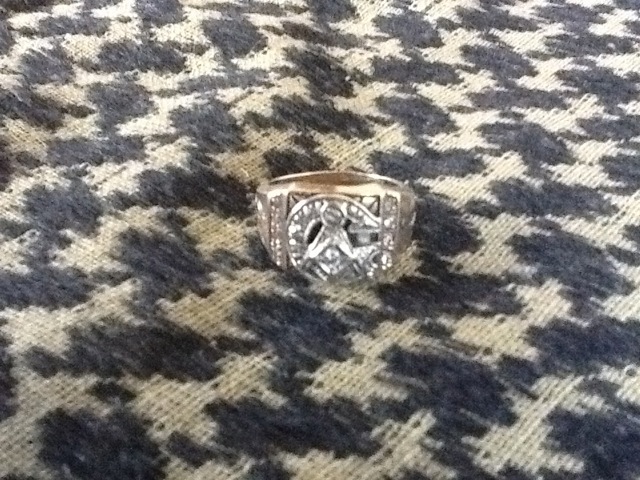 Looking at this ring now, as it sits on my finger, it looks a bit different than I remember from years ago. What I wouldn’t give to see the reflection glinting off this ring from my father’s hand again. Bro. Brian Schimian is Life Member A.O. Fay #676 in Highland Park Illinois and the Medinah Shriners - Lake County Shrine Club. He was also the Past Master Counselor of DeMolay - Lakes Chapter in 1995. Bro. Brian is also the lead contributor to Brothers In Arms blog, a pro 2nd Amendment blog page. "A leader is one who knows the way, goes the way and shows the way." Bro. Brian, thanks for sharing this with us. 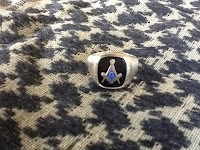 I, like you, seem to recall many fond memories of my father when I look upon his ring on my right hand. I too miss seeing it on his finger and still to this day, when I'm contemplating something, rub the ring and wonder, "what would dad do?" I am glad you liked the piece. Virtus Junxit, Mors Non Separabit - Whom virtue has united, death shall not separate. Great story brother Brian. I too am a firm believer in the "powers that be" and what they have in store for us here in this life.Most people tend to complain about how terrible their life is. I think that the GAOTU has so much love for us that he gives us challenges and sometimes let's things happen. The work that we have to do is to learn from these things and then help others that are going through similar challenges themselves. I loved your story!